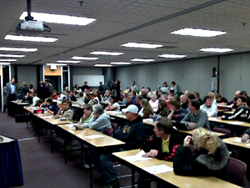 The city council chambers in Mason City were full Tuesday night. Mason City leaders have rejected a proposal to rezone the downtown so adult-oriented businesses could set up shop. Earlier this month, City Councilman Max Weaver suggested opening the zoning to so-called “gentlemen’s clubs” could spur growth. Last night, Trinity Lutheran Church Pastor Jim Magelssen presented the council a petition with more than 800 signatures from a dozen community churches. Pastor Magelssen says they oppose the idea of opening such an establishment for several reasons: it would exploit women for the gratification and entertainment of men, it would be harmful and degrade the city’s reputation while being morally objectionable. Cabin Coffee Company owner Brad Barber says the majority of the public is against putting strip clubs in the downtown area. Barber says they want to bring in families and businesses and attracting strip clubs is not the way to go about it. Ed Wineinger owns a building in the downtown district that Councilman Weaver suggested could house a gentleman’s club. Wineinger says the last thing he would want on his property would be any type of adult business. Wineinger says Weaver’s comments are irresponsible, reckless and potentially harmful to his reputation and he’s asking the councilman not to talk about the proposal any more. Councilman Don Nelson says the council needs to drop this issue and never look at it again. Nelson says, “We need to put this controversial issue behind us and move forward…by putting this thing to bed.” Weaver says he believes there are a number of people in the community who support the idea of men’s clubs in the downtown area. Councilman Scott Tornquist says he doesn’t support the idea of strip clubs anywhere in the community, but points out there are other spots in Mason City that are already zoned to potentially house adult-use businesses. In the end, even Weaver voted against the idea of further exploring the zoning of downtown to allow adult uses.